How to embed LeanIX into a company's IT landscape using SSO. The great advantage of Single Sign On (SSO) is that it not only allows users to use a central password, but companies can benefit from the increased productivity directly. If every employee saves 10 minutes per day the impact can be quantified easily. Moreover, SSO helps companies to reduce supportcosts and increase the level of IT security at same time. 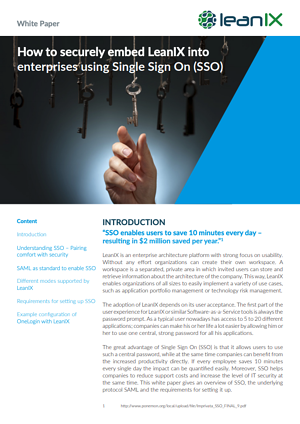 This whitepaper shows how LeanIX can be easily embedded into a company's IT landscape using SSO.